After Luang Prabang our next stop was Hanoi, so we had a choice of traveling by bus or taking a flight. The bus costs $50, and leaves at 18:00 every day, except Thursday. The bus takes 24 hours to get to Hanoi and is often described as the Journey From Hell. A flight with Lao Airlines takes just over an hour and cost us $155 each booking online. Travel agents in town were charging $165. Click here to book a great hotel in Hanoi. We seriously considered taking the bus just for the experience, but then we found out that the bus didn’t have a toilet. We then heard some horror stories about buses not stopping for over eight hours, or just stopping at the side of the road with people having to run behind bushes to answer their call of nature. This was enough for us to decide to fly to Hanoi. We checked with a travel agent in Luang Prabang, and they said a seat on the flight was $165. But we checked the Lao Airlines website and it was only $155 by booking direct with them. We had a very comfortable journey to Hanoi. The inside of the plane looked pretty new, and the service was great. If you can afford it, I’d recommend flying over taking the bus. There were fairly long queues at Hanoi immigration, and it took us about 30 minutes to get through to the baggage area. We then got a taxi to our hotel in Hanoi – The Landmark Hanoi. Taxi cost 350,000 VND ($17, £11). Beware that if you book a taxi at one of the counters inside the airport you’ll be charged extra. We were quoted $30 one-way or $50 if we booked a return. We were told that this was fixed price and would save us money. In reality all the taxis are fixed prices, so just walk outside and there are taxis there that only charge $17. For more info, see Hanoi Airport by bus or taxi. 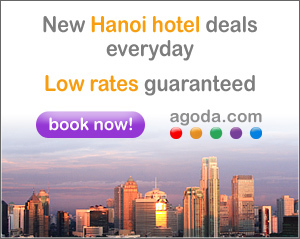 To book a hotel in Hanoi, including the Landmark Hanoi, just click the Agoda link below.